Lexbe eDiscovery Platform automatically generates with all the productions you create, a privilege log of all privileged documents for opposing counsel’s review. You can select which fields to include in the report, such as document Doc Type, Attorney -Client Privilege, Work Product, Confidential, etc., and export the log to an Excel spreadsheet. The Privilege Log is located under the Discovery Page. 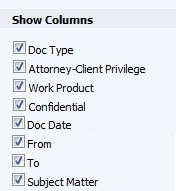 This window displays all documents in a particular case (after the Production Validation) that have been marked 'Responsive' and subject to 'Attorney-Client Privilege'. It will also show you which documents have been marked as 'Responsive' and 'Work Product' and 'Confidential'. 1-After validating and running your production, go to the Discovery>Privilege Log page and then select a Production by the title. The drop down menu will display all the productions that you already validated, but NOT downloaded or deleted. >Bates. This column refers to the Bates number of the privileged document. >Doc Type (Link). By clicking on the link you open the document in the Document Viewer in a new window. You can edit any of the privilege log fields in the Document Viewer or Discovery tabs. Then close the document viewer and refresh the privilege log page to see the changes made. >Attorney-Client Privilege. Checking this enables users to insert the text 'Confidential' in a document and protect certain communications between a client and his or her attorney and keeps those communications confidential. The document will not be displayed in the discovery production page; only in the privilege log. >Work Product. Indicates if the document is protected the attorney work product privilege. >Confidential. It shows in general which documents that required you to hold in strict confidence all information concerning the business and affairs of your client. >Document Date. During the self upload or an eDiscovery job, our software will extract from the emails the ‘Date Sent’ value and automatically populate the Doc Date or Date field by default. >From. Indicates the author(s) of the document. >To. Indicates the recipient(s) of the document. >Cc. Indicates the recipient(s) that were copied in the email sent. >Bcc. Indicates the recipient(s) blind carbon copied in the email sent. >Subject Matter. Indicates the subject matter of the document. The table to the right of the windows shows the information that can be included in the privilege log.You can customize which columns display in the privilege log window by checking and unchecking the columns to the left of the screen. When complete, you can export the privilege log to Excel from the button on the left side of the screen. Once in Excel, you can further modify the privilege log as may be needed and print or save as a file for delivery to an adversary. Columns you do not wish to deliver should be deleted in Excel. The dates for the Briefcase Export are in the US format. (Excel allows sorting on any of the exported fields). (NOTE: If delivering an Excel file, make sure you have turned off or removed all comments, 'fast saves', metadata saving, or anything else that might provide confidential information or work product, or evidence of prior versions). -The first document is the email body, while the subsequent documents will display the attachments. 1- Apply Bates-stamping during your production to display the email families sequentially. 2- Still from that page, click on the the production title hyperlink. The hyperlink will take you to the Browse page filtering only on the document being produced. b) Code the email family using the Built-in 'Doc Type' to designate files as 'Email Body' or 'Attachments'. You can use the ‘Multi Doc Edit’ function from the Browse or Search pages, by selecting multiple files you want to tag (check-box to the left of the documents). After selecting the documents, apply Multi Doc Edit 'Doc Type>Email Body or Attachments'. 3- Move to the Production Validation step, expand the entire email family included to the production set (e.g 'Responsive', 'Privilege', 'Work Product'), and then go back to the Production Job page and run the current production. 'Privilege' and 'Work Product' files are not included to the set of documents you produced. You can download and save those files to the desktop, by clicking on the 'Download Withheld' button. Lexbe eDiscovery Platform also allows you to create specific logs for redacted document or custom privilege documents. We also offer Project Management and Technical Services (billable hourly) if engaged to support your redaction logs efforts by helping you to design logs and executing specific requests for document identification. Please contact your sales rep or our Support Center if needed.